What are the best 2019 Home Security Options? With every passing year, technology advances. Home security options continue to become more advanced, sleeker and easier to install. Does that mean they are better? Let’s explore some of the more popular options and compare them to their hardwired traditional counterparts. RING has become one of the most popular 2019 Home Security Options. Boasting easy installations and wireless options, they’ve become an industry leader in simple home security. They’ve sold countless units at this point, with no sign of slowing. Reviews are generally positive, the entry cost models are relatively cheap and ease of installation puts this option within reach of the typical homeowner. But it does largely rely on the use of an app, and monitoring services are extra. So, while this is a great choice for the casual user looking to bolster their homes security, it may not be the best fit for a large indoor/outdoor space with many vantage points and valuables within reach. Nest is another big name in the DIY home security market. Nest also offers optional burglar alarm monitoring for an additional fee, and boasts connectivity with Google Assistant, to help you keep tabs on your home while away. Nest can connect and play nice with dozens of smart devices in your home, and the list of integrations for most in this category seems to be steadily increasing. A comprehensive security system from Nest is typically a little more than some competitors, at around $499. 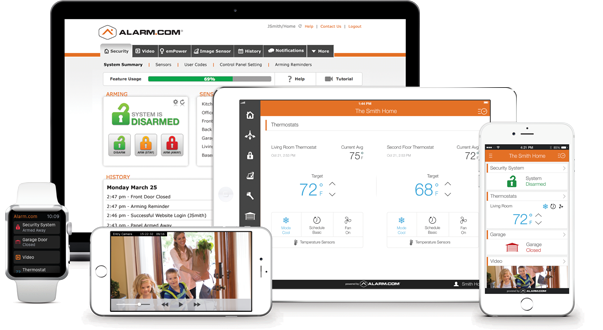 When compared to a full fledged home security system, it’s well below the average. Nest is largely tied in to the Google family of products, so keep that in mind if Nest tops your list of prospects. Another top brand in this category of home security systems is SimpliSafe. Also offering a wide variety of options, SimpliSafe aims to make home security, well…simple! Through LifeShield, you can tack on home monitoring for 24/7 activation. These guys are well known for their great customer service and wide array of alerts. One of the only downsides to this line of home security devices is a slightly smaller list of compatible devices and systems it can interact with. As more of a standalone device, this is a product you’d probably need to invest a bit more to get comprehensive protection, because of the lack of connectivity with other devices. As with any decision regarding your home’s security, please consult a professional. Nothing is more important than protecting your family. And if the day ever comes when you rely on technology to help in that protection, you’ll be glad you invested a few dollars into a solid security system to protect what matters most. Call the pros at Circle Security Solution to make sure covered and secure! Our experts can give you more information on the best 2019 Home Security Options. We can be reached at 305-667-0444 or you can get a free quote by clicking here.